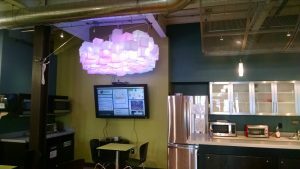 Burlington, VT- If you attended the 2015 Art Hop or have visited the new Center for Communication and Creative Media building recently, you may have seen pixelCloud showing off overhead. pixelCloud is the brainchild of Ken Howell, according to Terry Sehr, an MFA student who worked extensively on the project. pixelCloud is an interactive sculpture in development by the EMC Sandbox team at the Champlain College MakerLab. pixelCloud makes the conceptualization of the internet as a cloud in physical and tongue-in-cheek fashion. The project draws attention to the social media convention of reducing complex human experiences to simplified, peer approval systems. pixelCloud consists of approximately 200 individually lit cubes arranged into a cloud shape. Each cube is constructed of soda straws, coffee filters, Elmer’s glue and addressable RGB LED’s. The sculpture can be tweeted to, “reads” the emotion of the tweet, and executes lighting effects that echo that emotional quality. Terry worked on the programming element of pixelCloud. The Processing sketch he wrote reads the twitter feed and parses out any words that are recognized as conveying emotion (approximately 15k words in the database). Each tweet is then scored on 7 basic emotions: afraid, amused, angry, annoyed, apathetic, happy, inspired, and sad. The results are then sent to an Arduino which executes one of an array of lighting effects that echo that emotional quality. Processing is also responsible for the display accompanying pixelCloud. The on-screen display lists the tweets in the order they were received and every ten seconds a new tweet is featured and given a light animation. Most animations are associated with the determined mood, except for a few easter egg exceptions (or should I say, egg-ceptions?). If a tweet includes an EMC related term, such as Generator or Maker Lab, pixelCloud will perform a special animation and become a special color. This is a great feature for events, as an event specific term can be programmed in. This was the case for the South End Art Hop, if a tweet included the term “Art Hop,” resulting in a hopping light effect across the cloud. 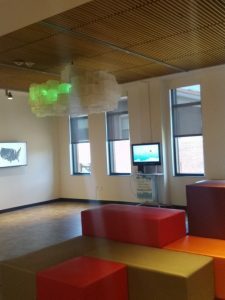 Revealed at the Art Hop, pixelCloud’s current home is inside Champlain College’s CCM building. It is hanging just outside the art gallery as part of the “BEAUTIFUL COMPLEXITY: Data Visualization 01” exhibition. The exhibit also features work Jonathan Harris, Fernanda Viégas, and Martin Wattenberg. Be sure to visit and explore the exhibition the next time you are on campus and check out pixelCloud!